Tuberculous lesions: why is it important to confirm the diagnosis? Passive surveillance based on the detection of tuberculous lesions in slaughtered animals is key to the eradication of tuberculosis. 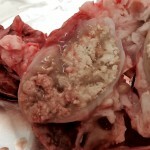 If compatible lesions are detected laboratory confirmation, including PCR and histopathological analisis, is essential. It is especially important to obtain a microbiological culture to isolate mycobacteria and determine the strain causing the new outbreak. This information is key to determine the outbreak origin and to establish effective epidemiological control measures. Target tissues to detect tuberculous lesions are the lungs and respiratory lymph nodes (tracheobronchial and mediastinal) and retropharingeal lymph nodes. In case lesions compatible with tuberculosis are observed, samples should be maintained at a refrigeration temperature and must be sent to the laboratory as soon as possible in order to optimize the success of the microbiological culture. If the shipment has to be delayed more than 24-48h it is recommended to freeze a portion of the lesion and fix another portion in formaldehyde. Freezing maintains the mycobacteria viable and prevents growth of other contaminant bacteria that might hamper the microbiological culture. If the whole sample is fixed in formaldehyde then the microbiological culture is NOT possible since the formaldehyde inactives the mycobacteria. 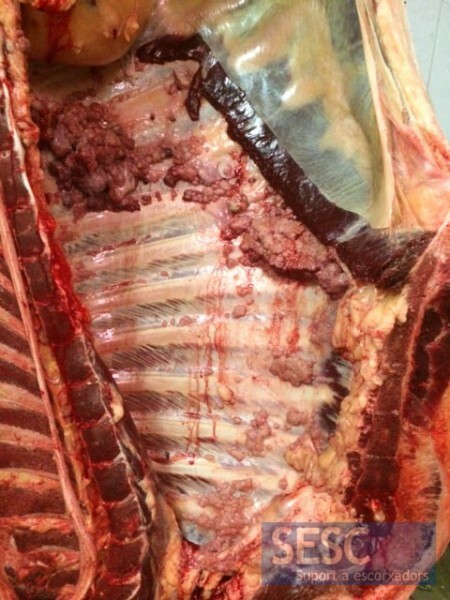 Cattle carcass, 84 months old, Bruna dels Pirineus breed, with pearly tuberculosis lesions in the parietal pleura. Detail of granulomatous lesions on the pleura. The lymph nodes of this cow also had lesions compatible with tuberculosis. A: retropharyngeal lymph node. B: tracheobronchial lymph node. C: mediastinal lymph node. Correct packaging of biological samples. 1º: Primary airtight container. 2º: Secondary container, preferably thermally insulated, including a refrigerant block and absorbent material. 3º: External box with documentation of samples, printed analysis application form and destinatary adress. 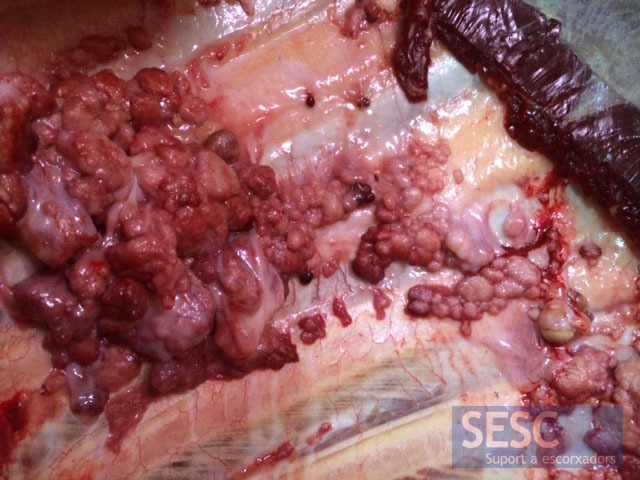 This entry was posted by SESC on 21/08/2014 at , and is filed under Bovine, Thoracic cavity (bovine), Lymphoid (bovine). Follow any responses to this post through RSS 2.0.You can leave a response or trackback from your own site.